Oh Friends, I would be lying if I didn’t tell you this week has been a rough one. I am starting to see why people say that renovations are so hard. They mean emotionally. 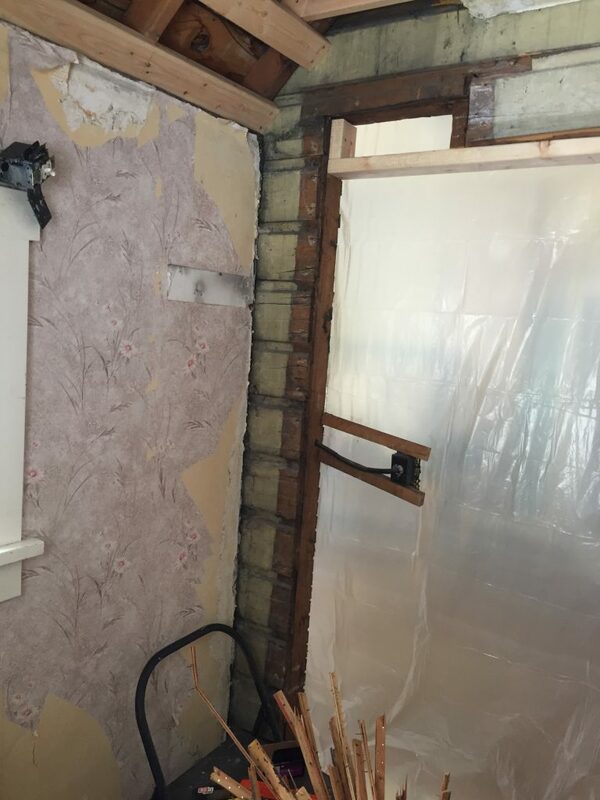 Between asbestos and lead dust scares, we have been pulling our hair out hoping we are keeping ourselves and our daughters safe during our renovations. But I am getting ahead of myself here. Let’s start with the fun stuff, some progress pictures! As you can see, we are opening up the wall next to the door to make a larger foyer, it was a bit crowded before. This is where we found insulation with asbestos. We are handling that this week, and just barely opened up the bulk head to match the existing roof line. 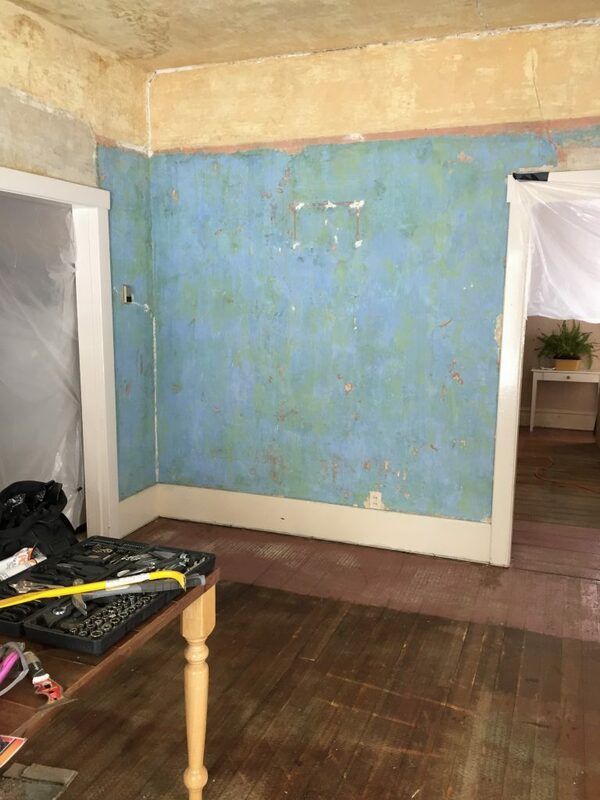 You can see in the photo below, where the plaster wall on the left ends is where the bulk head started. 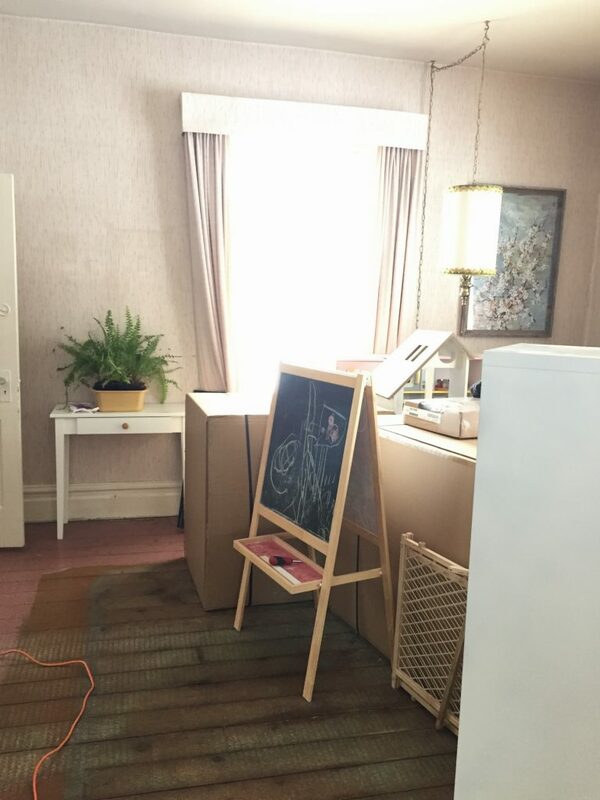 We are thrilled to see some of the original clapboard exterior. 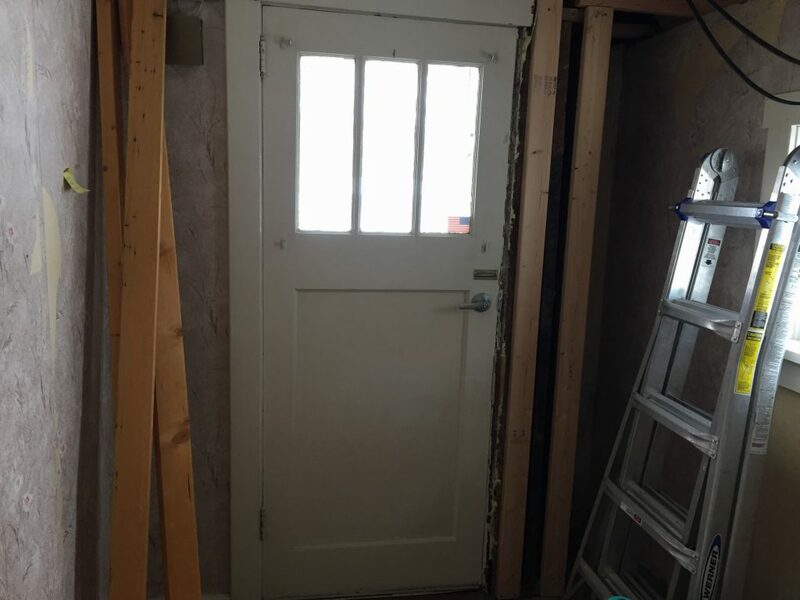 We had our suspicions that the foyer was added on to the house, and seeing this exterior siding underneath the plaster walls confirmed it. We will paint the clapboard to match the rest of our decor, but plan to leave it exposed instead of covering it up again. This little nook has our mailbox built in. Yes, we are lucky and the mail man delivers to our doorstep! My girls love it and look forward to the mail coming every day. We will build a few floating shelves and add a couple baskets to utilize this nooky space. *See two photos previous for a more complete view of this nook. This wonderful blue/green was found underneath our wallpaper. We have discovered that it is calcimine paint, and I would LOVE to leave this one wall with the blue/green. It is so amazing, and has so much character! This calcimine has proved to be tricky. It doesn’t adhere well, and as a result paint peels off of it. 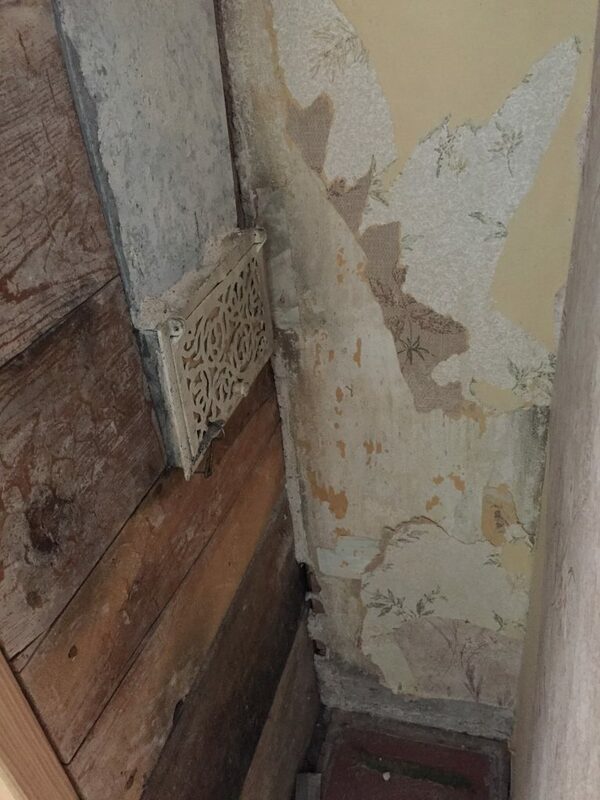 The only way to solve the problem is to scrape it off the walls and expose the original plaster. Guys, we have calcimine on virtually every wall and ceiling in our house!! We are still scratching our heads a bit about what we are going to do about the walls in the other rooms of the house. 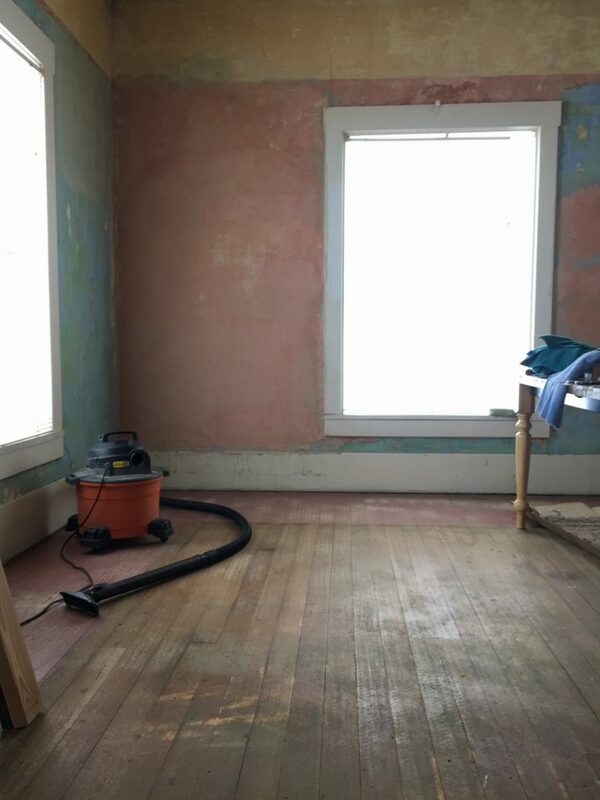 This room, we will scrape, texture, prime, and paint. Phew. We also exposed this brick chimney. 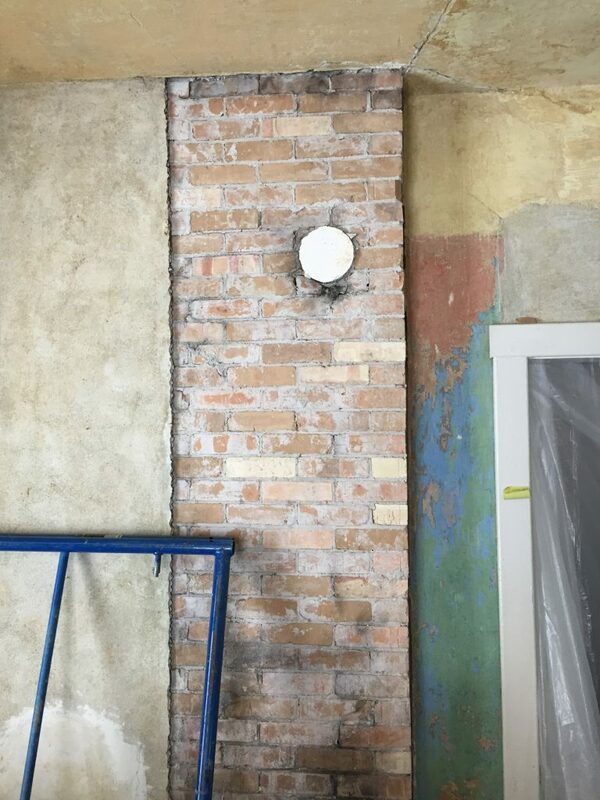 We will add wood trim around the edges where the plaster wall meets the brick, and leave it as is. So gorgeous! For the rest of the room, I am working on some creamy drapes for the windows. I would love to get rid of the blinds and only use the drapes for privacy down here. Our drapes will hang far enough away from the window trims that the trim work around the windows will be showcased instead of covered. 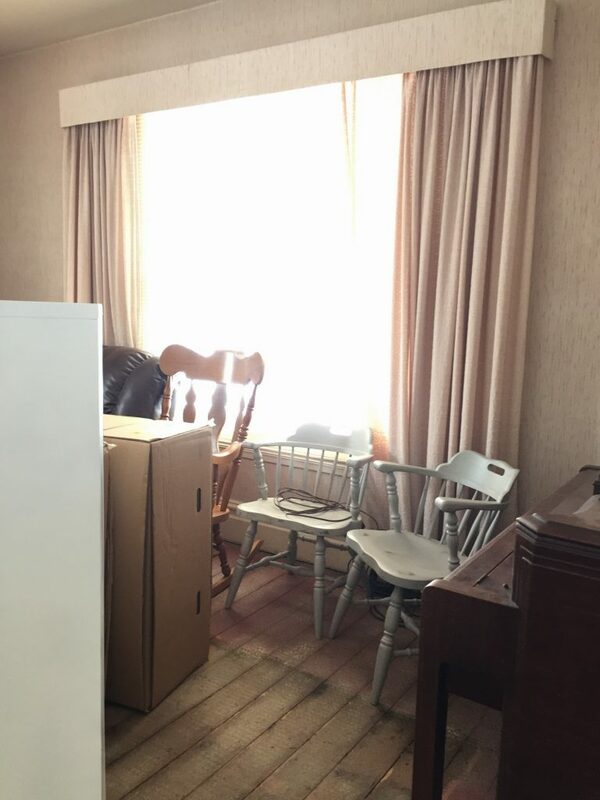 Here is what the drapes were when we moved in (this picture is actually of our living room, but the drapes are the same). Those beautiful windows were completely covered! And, the flooring. Yes the carpet is gone as well! 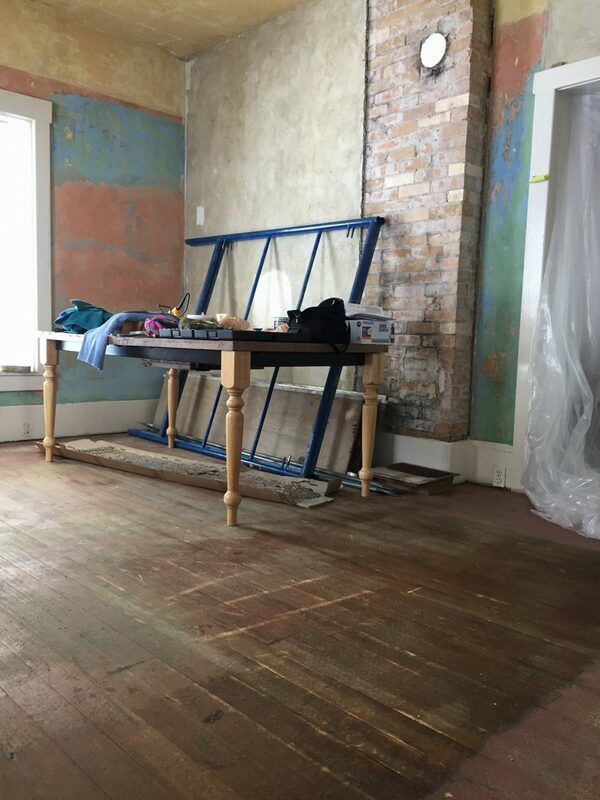 We are still trying to decide what to do, the original hardwoods are painted around the perimeter and we are thinking it is probably lead based paint. With two little girls running around, and another on the way, we are apprehensive about removing the lead and exposing our kids to that. We have considered repainting them white, but will likely refinish all the wood floors throughout the house, (with the exceptions of the bathrooms and kitchen). I do like bits of painted floors, but I can’t say I love painted wood enough to want that as my flooring throughout the house. I crave the warmth that the natural wood color gives to a space. That about wraps up where we are at with the space. I hope that the next update will look a little less crazy, and a bit closer to livable. Pray that we won’t find any other surprises! Thanks for following along with our journey and renovations. I have loved sharing it with you on this blog, and on Instagram. I have received so much encouragement and support from my readers, and it truly keeps me going on the hard days. You can find the beauty and have such lovely ideas. Thank you Nan! We truly couldn’t do it without you!